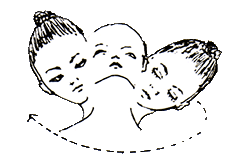 An Introductory Course, Designed and Written by Guru Rattana, Ph.D. The yogis say that a person's age is determined by the flexibility of his/her spine. The most basic goal of Kundalini Yoga is to take care of the spine. This lesson offers a series of exercises (a kriya) to activate, align and loosen up the spine. Lower back pain and upper back stress are some of the most common health complaints of adults. The best way to avoid backaches is to take care of your spine on a daily basis. There are no quick fixes for back pain, but this exercise set is an effective maintenance program. Sit quietly and be with your breath. Consciously slow down the breath and breathe from the belly. Be with the sensations in your body. Tune into your own rhythm. Allow a few minutes to calm down, center yourself and create your own space. Before beginning Kundalini Yoga practice, always "tune in" by chanting the ADI MANTRA - See lesson 3. Sit in easy pose. Place the hands on the knees. Deeply roll the pelvis around in a grinding motion. Relax into the movement. Make it a moving meditation. Do 26 rotations or 1-2 minutes in each direction. Benefits: This exercise opens up the energy in the lower spine, massages the internal organs and aids in digestion. Sit in easy pose. Grab the ankles. As you inhale powerfully, flex the spine forward, keeping the shoulders relaxed and the head straight. Do not move the head up and down. Exhale and relax the spine back. Continue rhythmically with deep breaths. As you inhale feel the energy go down the spine. As you exhale feel it come back up to the third eye. Mentally bring SAT down and NAM back up the spine. 1-3 minutes or up to 108 times. To end: Inhale deep, hold the breath, apply rootlock (mulbhand) (lesson 8), exhale and relax. Sit quietly and feel the energy circulate in your spine and throughout your body. Benefits:This exercise stimulates and stretches the lower spine. 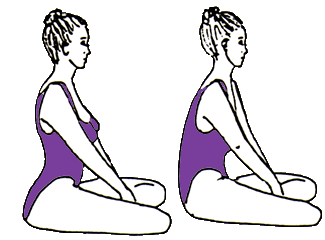 Sit on the heels; place the hands flat on the thighs. Continue spinal flex as above with a powerful breath. Sit with a straight but relaxed spine. Adjust the head so that you feel like it is sitting on top of the spine by slightly moving the head back and bringing the chin down slightly. Roll the neck slowly in one direction and then in the other. Let the weight of the head move the head around. Do this very methodically so that you go slowing through tight spots and work out areas of tension. At least one minute in each direction. To end: After this exercise, sit quietly and be with the sensations in your body and spine. 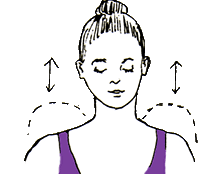 Benefits:This exercise removes tension in the neck and stimulates the thyroid. Continue 1-2 minutes or 26 times. To end: Inhale center, hold the breath, apply rootlock, exhale, relax and feel the energy circulate, especially at the level of the heart. Benefits: This exercise opens up the heart center and stimulates the upper spine. 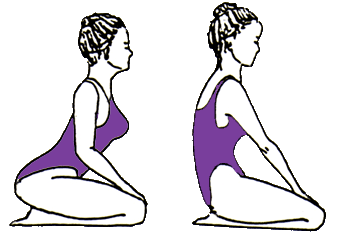 In Easy Pose, clasp hands behind neck in Venus Lock (fingers interlaced) and bend straight sideways at the waist, aiming the elbow toward the floor beside the hip. Inhale as you bend left, exhale right. Don't arch or contract the back. Bend sideways only. This exercise can be done standing. 1-2 minutes or 26 times. Benefits: Side bends stimulate the liver and colon and increase spinal flexibility. Still on the heels or in easy pose, shrug both shoulders up on the inhale and down on the exhale. To end: Inhale up, hold, apply rootlock, and relax. Lie on the floor with the palms on the floor under the shoulders. As you inhale, slowly arch the spine up, leading with the nose, then chin, then pushing off with your hands vertebra by vertebra, until you are arched back as far as possible with no strain in the lower back, concentrating on a. good stretch from the heart center up. Breathe long and deep or do Breath of Fire. To end: Inhale, hold, pull the energy up the spine with the root lock. Exhale very slowly and come down one vertebra at a time. Relax. 1-3 minutes. Benefits:This exercise strengthens the lower back. Removes tension in the back and balances the flow of sexual energy with navel energy. Bring your knees to your chest, grab them with the arms, and rock back and forth on the spine, massaging it gently from the neck to the base of the spine. Make sure you have a soft surface. Benefits:This exercise circulates the energy and relaxes the spine. Spread the legs wide apart, grasping the toes or any other place on the legs where it is possible to keep the knees straight. Inhale center and exhale down to the left leg, inhale center and exhale down to the right leg. Move from the hips to open the pelvis. Avoid simply bending and arching the upper spine. Keep the spine comfortably straight and get a good stretch in the back. Loosen up the muscles, but do not strain them. Continue with powerful breathing. 1-2 minutes. To end: Inhale center, hold the breath, apply root lock and then relax. Bring the legs together and bounce them up and down a few times to relax the muscles and massage them. Benefits: Opens up the pelvis and stretches the leg muscles. Legs outstretched, bring right foot into left thigh, and slowly bend over the left leg to grab the foot or ankle (or wherever it is comfortable), keeping the leg flat on the ground. Breathe long and deep or do Breath of Fire. 1-2 minutes each side. To end: Inhale deeply and exhale several times deepening the stretch. Then slowly come up. Bounce the legs and massage them. Switch sides and repeat. Benefits: This exercise stretches the leg muscles and loosens up the lower back. Come on the hands and knees, knees shoulder width apart. Inhale as you flex your spine down and bring your head up. Exhale as you flex your spine up in an arched position with the head down. Keep the arms straight. Continue rhythmically with powerful breathing, gradually increasing the speed as your spine becomes more and more flexible. To end: Inhale in saggy cow, hold, pull the energy up the spine with the root lock. Exhale and relax on the heels. Sit quietly and let the breath slow down. Feel the energy circulate. Concentrate at the third eye. Benefits:This exercise is known as the Kundalini chiropractor. Done regularly it loosens up and adjusts the spine. Lie down on your back and simply relax for a moment. Then bend your knees and draw the heels up towards the buttocks, keeping the feet flat on the floor. Grab your ankles and holding on to them, slowly raise the hips up, arching the lower spine and lifting the navel towards the sky. As you lift up, slowly inhale through the nose. Hold the breath as you gently stretch up, lifting as high as is comfortable, then slowly relax down again as you breathe out through the nose. Slowly repeat this lifting up and down movement a minimum of twelve times, synchronizing the breathing with the movement of the hips, for a maximum of 26 lifts. To go from the minimum number of 12, to the maximum number 26, increase your total 1-2 lifts per day. To end: Inhale up, hold the breath for ten seconds, pull in the navel and apply the root lock. Then relax down, stretching the legs out. Totally relax and feel the energizing effect of the exercise. Exercise Tips: If you can't grab your ankles, let the arms be at your side and lift up using the arms to help push you up. People with any history of lower back pain should check with their doctor before beginning. Try to let your breathing do the work--inhale the hips up and exhale them down. This exercise will automatically get you to breathe deeply. Keep the eyes closed throughout this and other exercises so that you can feel your body move rhythmically, without visual distractions. Rest on your back for two minutes after the exercise and just enjoy its vitalizing effect! Benefits: This exercise releases abdominal stress! It gives you an immediate boost of energy throughout your body that lasts well into the day. It also stimulates your thyroid. It allows you to breathe deeper and adds to your energy level. It moves the energy from the lower spine to the upper spine. Deeply relax your back, hands to the side, palms facing up. Simply be with the sensations in your body and enjoy the feelings. Sit quietly and meditate. Be present to the sensations in your body. Increase your awareness to include every part of your body and spine. Consolidate your presence by feeling all your sensations simultaneously for at least one minute at the end. 2-5 minutes or as long as you like. To end: Inhale and exhale deeply 3 times. Raise your arms above your head, stretch your spine, shake your arms and send blessings to the world. Carry this feeling of blessings and gratitude with you throughout your day. to ALLOW the energy to move and align itself. In later lessons we will experience the specific energies of each of the chakras. First we want to establish a baseline of spinal awareness. This series of exercises works systematically from the base of the spine to the top. All 26 vertebrae receive stimulation and all the energy centers receive a burst of energy. These exercises increase the circulation of the spinal fluid, which contributes to greater mental clarity. Regular practice of this series will give you increased vitality, help prevent backaches, reduce tension, and keep you young by increasing the flexibility of the spine. Exercise Set for Maintaining a Flexible Spine is one of over 100 sets and meditations from the book Relax & Renew by Guru Rattana, Ph.D.